Morgan is confronted by two men with Ws on their foreheads, members of the Wolves. Aaron and Daryl track a man in a poncho. They discover potential food but instead set off a trap. Morgan rescues them at the last minute. He shows Daryl a map that reveals its connection to Rick. Father Gabriel leaves Alexandria and kill some walkers. He returns but leaves the gate open. Eugene apologizes to Abraham, who also apologizes. Tara wakes up. Glenn fights Nicholas, but chooses not to kill him. Rick discovers the open gate and fights off some walkers inside Alexandria. He arrives at Deanna’s meeting about whether to exile Rick. He says he can help the people of Alexandria. Pete shows up and kills Deanna’s wife. She tells Rick to kill Pete. After a fight with Sasha, Father Gabriel her and Maggie pray together. 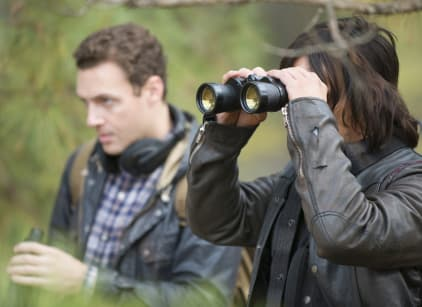 Morgan, Daryl and Aaron return to Alexandria.